Joe “Dante” Delfino is chief engineer and producer at Miller Street Studios in Chicago, Illinois. He’s worked with artists including Wu-Tang Clan, Lecrae, Vic Mensa, and Ta’Rhonda Jones. Over the past decade he’s built a solid reputation for himself in the music business for being able to quickly and effectively produce quality tracks while possessing superb studio etiquette and making the artists feel at ease. But more than that, having the right mindset, one of someone who is actively engaged in making their careers happen, well that’s really what it’s all about. Those who succeed are entrepreneurial in their approach and take the initiative when it comes to getting things done and learning the material, no matter what. “What I always encourage my students to do is that you have to be proactive. When you get off work, even if you can’t come into the studio, at least spend an hour on Pro Tools.” Spending time working on your craft, perfecting your approach, and figuring out what your specific strong points are is exceedingly valuable. It’s just that simple. You have to keep working at your chosen profession in order to improve. This means actually putting the hours in. Dante understands this firsthand. Experimenting and making one’s own music, wondering about things, learning new things in the process, all of that informs the work and makes one a better engineer, producer and someone people want to work with. Such an attitude feeds right back into the culture at Miller Street Studios which has, over the past few years, become the “go to” spot for indie artists throughout the greater Chicago area. Rather than getting an inflated ego about the success he’s seeing, Dante remains calm and appreciative of being able to work with the people he esteems as artists, not celebrities. “I’m lucky that I’m able to work with a lot of really good clients. I think one that really sticks out to me was working on Trip Lee’s album with Lecrae on Reach Records. I also really enjoy working with Ta’Rhonda Jones (from TV’s Empire)…She’s working on a project as well. She flies back and forth between LA and Chicago,” Dante said of working with his clients. And, you’ve got to be able to deliver on everything you’re selling. Working hard to learn the gear, the techniques, and consistently making music will result in bona fide skills, the stuff that’s going to keep those clients coming back and sending more clients your way. The drive to build a solid, exciting and rewarding career should propel anyone serious about working in music to make connections, seek out opportunities, build something that’s going to set them apart from anyone else in the business. Starting right on day one, lesson one, Dante tries to instill a can-do, entrepreneurial approach in his apprentices. Getting the real world experience and meeting working industry professionals is what this program offers its students. Making something of those experiences, building better connections, going the extra distance and making it happen, that’s what the future pros are doing today, tomorrow, and every single chance they get. 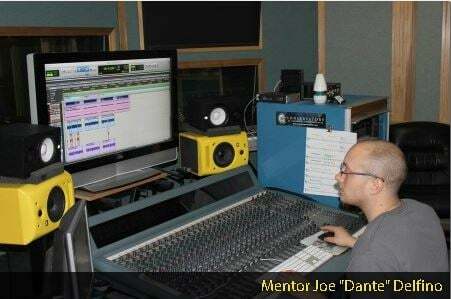 Mentor and Recording Connection grad co-produce New Single!